Open your email application (such as Outlook), start composing a message, and then use the email application’s Attach command to add one or more files to the message before you send it. You can attach any file — not just Office data files. For example, you can send family photos that way, or even video clips. 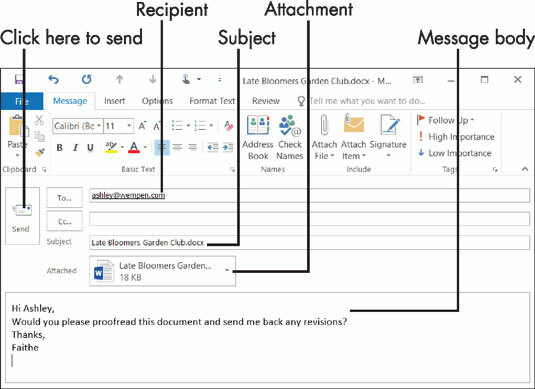 From Word, Excel, or PowerPoint, send the active data file as an email attachment. Open the data file that you want to send, in whatever Office app you created it. Choose File→Share→E-mail→Send as Attachment. A new message window appears, with that data file as an attachment. Fill in the email recipient(s) in the To box. The subject line is prefilled with the filename. Change it if you want, as shown in the following figure. The file is listed as an attachment in the Attached field. (Optional) If you want to type some explanation of the file, do so in the message body area. A labelled email in Outlook 2016. Note that the subject line is prefilled with the filename. You can also copy and paste data from one of the apps directly into the body of an email message that you’re composing. This lets you avoid sending an attachment, which might be helpful if you’re sending a document or a photo to someone who isn’t very experienced with email and might not understand about attachments.